Do Birds Bring Us Messages? I left Florida and my husband I began reluctantly heading for the “colder than usual north.” We had been in Florida for 5 weeks. While enjoying memories of adventures in sunshine and warmth, I was reflecting on how much we enjoyed our time out in nature during this time away as well as more meditation time than I usually have during my more “normal” life at home. It has been a wonderful time to catch up on spiritual reading and even do a few online courses. “Communing with nature” is an expression we hear often as parks encourage us to spend time enjoying wildlife found in beautifully preserved areas away from the hustle and bustle of our daily lives. My husband and I felt so blessed walking beaches teaming with birds, marine life and into parks blessed with not only amazing birds, but wildlife of many varieties. We realize that we are always the “intruder” into the homes of incredible animals. Today I want to share a very different animal encounter we were never expecting that turned into…an adventure! It all began on the Friday before Easter as I headed out to my car to go get groceries. My son and his family with two of our young grandchildren were arriving to spend their spring break with us in our rented house. 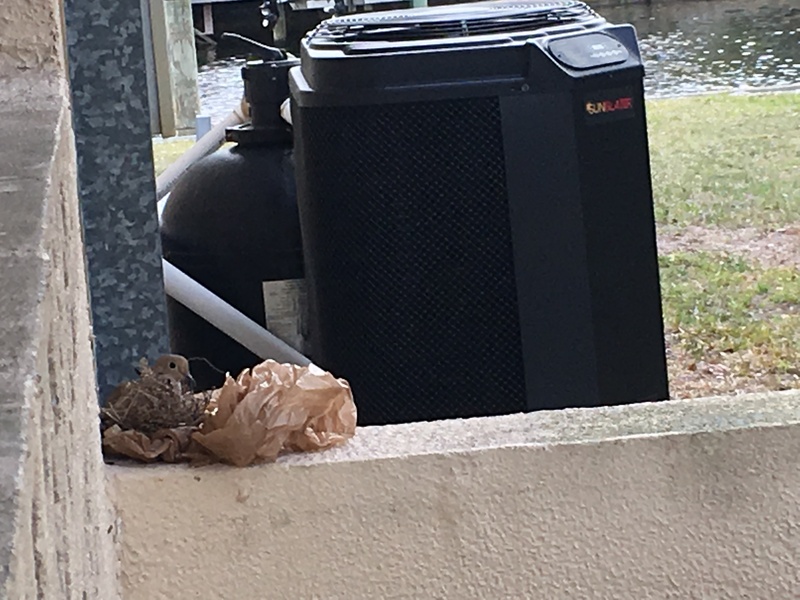 My mind was on my “list” of errands as I got in the car starting the engine only to be startled by a bird flapping away right in front of my eyes. 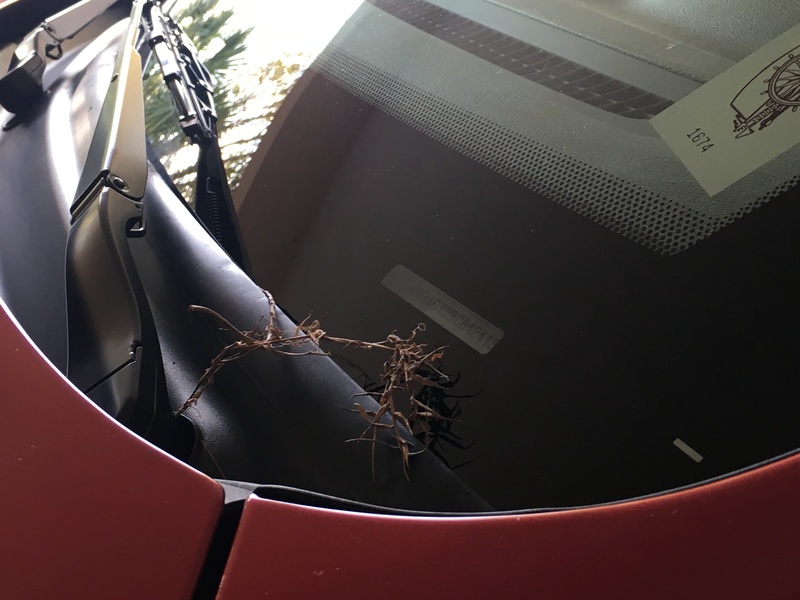 It took a minute to notice there was a nest built in the sunken well that holds the driver’s side windshield wipers. I chuckled and took a picture as I picked up a nest to show Doug and save it to show to my grandchildren. I even decided to put chocolate egg treats in it for Cade and Ellee. I didn’t think much more about it knowing birds do try to enjoy the fruits of a man made built structure! But, a moving one? We had just heard the Everglades driver of our boat saying the Eagles and Osprys have built their nests on posts in the water instead of in the trees for years. On Saturday, we were heading out for our morning walk and there we found another nest in the very same spot, but this time there was a dove sitting in it staring at us. Of course we ran to get cameras and tip toe around the back thinking she would certainly fly if we came close. Then, off we went for a long walk brainstorming how to safely “move” the nest this time to a tree and convince this dove to nest in a non-moving place! Feeling a bit guilty about just “taking” the last nest, I’m texting Marj and of course she reminds me about using gloves. Work gloves in a rented house? Not a chance, so we found a new use for our golf gloves! We safely moved the nest to a near by tree. We went about our day when my friend Mary reminded me that doves are a symbol of the Holy Spirit. My heart skipped a beat knowing birds and animals often show up in our lives for specific reasons. I knew spirits could manipulate animals to “show up” for us. I’ve learned to pay attention because I have experienced this many times. Earlier that morning I had a very significant and powerful meditation. I shared that message last week about TRUST. Of course I began searching for the significance this dove might be bringing into my life. I started reading Wikipedia. Was I headed to a difficult time? Am I still reliving “old” memories? Am I struggling spiritually? 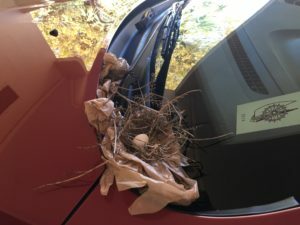 I had stuffed balls of wadded up plastic bags into the cavern of my car to discourage nesting. So, we didn’t see any signs of nesting the rest of the day. When I checked the tree where I placed the nest, it was empty. My mind pondered thoughts like; EVERY person is holy spirit and human. I am not special. My belief is unshakable ~ perhaps that makes a difference in the vibrational light energy my body sends out to the spirit world? Doves feel that? Thinking the dove was gone, we woke up to a beautiful Easter sunrise “surprise“! 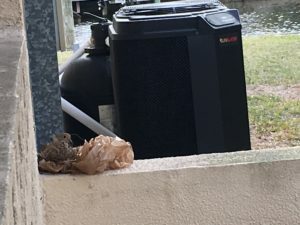 Not only was my dove back, but she had built her nest right on top of the plastic, pulling the plastic to smooth it out! We decided maybe a half wall near by the carport would be the new moving place. 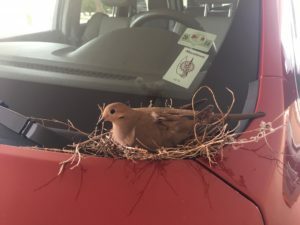 We went back out with our plan, only to find both doves sitting on the nest together. My soft heart for the pair sent me back into the house. 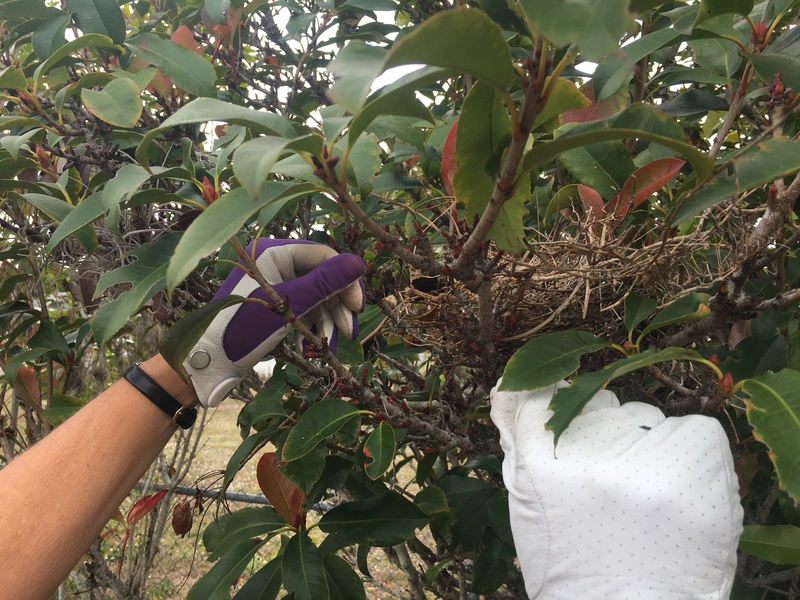 We finally realized we cannot keep a nest on our car so out we went with gloves once more. My dove was alone and completely still and just starring at me…unsettling. I was inches from her and she didn’t move. The last time I looked closely into the eyes of an animal it was a tiny sloth and time suspended for me. As I was pondering this she flew (almost like she heard me thinking!) and I was the startled one looking down at the nest to see an egg! No wonder she didn’t move. 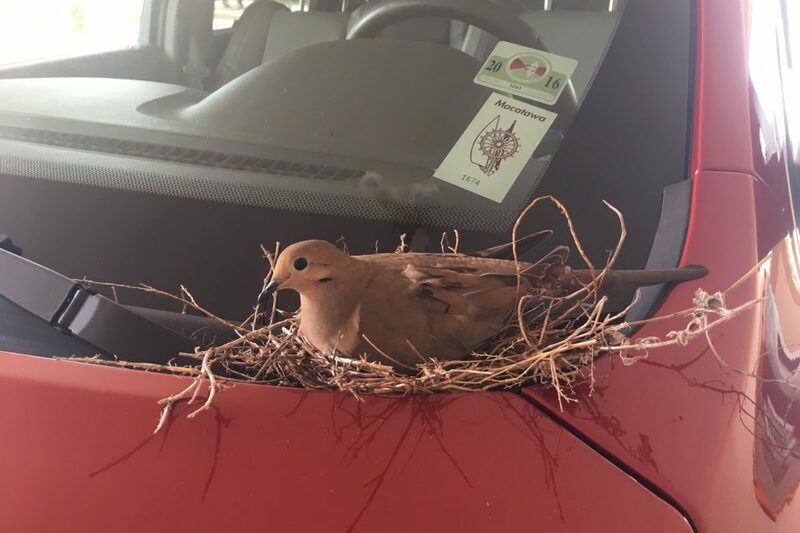 We went back into the house and then Momma dove came back. It was Easter…we chose to to leave Momma bird on our car while we walked to have our own church service in a quiet meditation mode on the beach with nature for our sermon. There were other people there too, but we felt a peaceful, loving and compassionate love for each person’s life and why they were there. Strangers, but I was seeing the beauty in the ONENESS of all of us. We are ALL connected. Upon our return we sighed seeing her on the car…and decided to move the nest, plastic and all with the egg carefully to the wall. It was hard for me, but I also knew my grandchildren, 3 and 5, would be arriving in a few hours and our car had to move. So, I reminded myself that doves are used as symbols of love, peace or as messengers. Doves appear in the symbolism of Judaism, Christianity, Hinduism, and Muslim traditions as well as paganism. Even the military and pacifists groups use them as symbols for their causes. 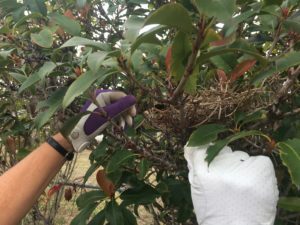 I shared the story and showed my grandchildren where the nest was with no Momma sitting on it. I talked about how we go out into nature and disturb their world, often without even thinking. I felt that maybe it was the bird’s turn to disturb our environment and help us ponder the meaning of the spirit world living among us. I decided I would accept the experience as a blessing, even though a baby bird was obviously not going to be born. For two days we experienced Momma bird sitting on our car each morning or evening. There was no nest, just her. Was she mourning instead of sitting on her egg around the corner? She’d leave for awhile and we’d find some nesting pieces sitting in the same spot. Sad to watch her. It was Wednesday, the 3rd day. We came back from a long day at Busch Gardens to find her sitting on the egg in the nest we moved to the wall! Why 3 days? Would the egg still hatch? Is there significance to the number of days? YES…most likely. I will never know for sure. I was saddened to find that after another few days, the egg was kicked out and the nesting materials scattered. She was gone. I did know there were messages for me, but it took me until today as I was writing to find the message. I am on the road, I opened my phone to search for more dove “meanings” while traveling and this was the first message that surfaced. I am taking classes right now in “Reconnective Healing” by Dr. Eric Pearl. I have been fascinated to find his information matches mine completely and I have loved my classes. It was Thursday night before Easter that I was debating…pondering, and finally deciding to spend the money and become trained by Dr. Pearl in Chicago in November. I asked the spirit world for a sign that I was doing the right thing. 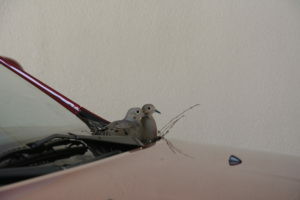 It was Friday morning that the dove first appeared on my car. It never occurred to me until this writing that I received my answer. You just heard the story. Thank you for letting me share it with you. What signs have you received from the spirit world? I would LOVE to hear them! So profound and the beauty of the mystery appearance appeared to you. What a lovely post and a beautiful message. I shall think of it as I observe doves currently looking to nest on our balcony. 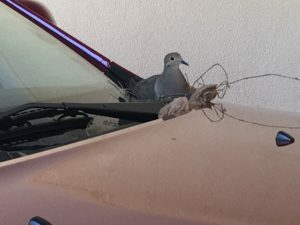 Yes, the birds sometimes choose not so convenient places. Last spring up north, a robin built his nest in our window box. I had to wait to plant the flowers. However it was such a joy to watch the three eggs hatch into little baby birds. But is was too much in the open and eventually a hawk got all three of the wide-eyed babies. Today as I looked out my window at our bird feeders, who was sitting right underneath but a male mallard duck! He has stayed for hours. At first the squirrels were not so sure about this new event and stayed away, but now all the varieties of birds are coming in and out, and the squirrels are eating the fallen seeds. It is a picture of “peace on earth”! I loved this! How profound! And the takeaway for me was how subtle the message was. It reminds me of the biblical parable in Matthew 13 about seed falling on fertile ground. I especially like verse 11. Thank you Terry, for sharing . Thank you Mary. And thank you for reminding me about the biblical parable in Matthew about seed falling on fertile ground. I think we all experience significant spiritual meanings in our lives, some prove more powerful than others. We are each unique beings and the flourishing of seeds in our lives can come in such fascinating ways!